RIM unveiled the BB7 OS powered Blackberry 9720 a few days back with an expected launch date in Europe and other countries in the coming weeks – expected to September for UK residents. Surprisingly, the device is now available in UK through an online retailer for a nominal £179.99 for the unlocked version. 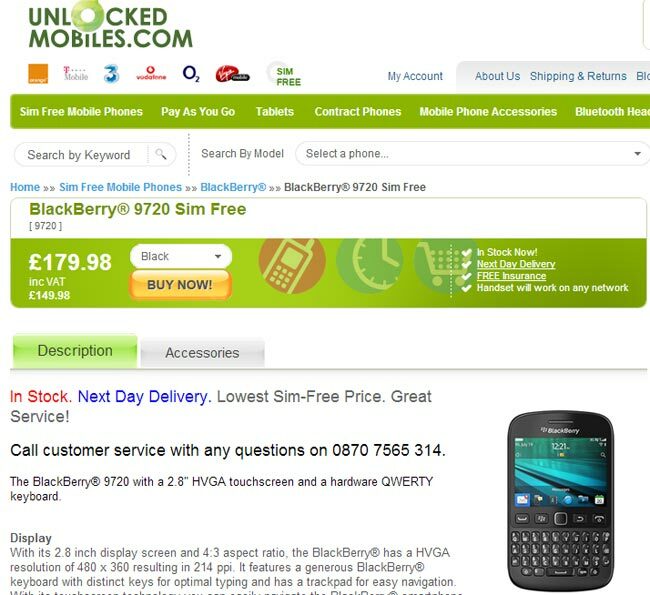 Unlocked Mobiles is offering the SIM-Free version in UK that with an expected delivery time of 1 day. The device features a 2.8 inch display with 480 x 360 pixels resolution, 806MHz single-core processor, 512MB RAM, 512MB internal storage with microSD card slot and a 5MP back snapper with LED flash. On the connectivity side, the device features WiFi, Bluetoot, GPS, mobile hotspot and GMS/HSPA. On top of it, the device runs the outdated Blackberry OS 7.1. Currently, the device is only available in black color. The device does not offer something high-end and even brings an outdated OS. The company is already having troubles promoting BB10 OS and releasing a device with outdated software may not be the best move. However, if you still want to get your hands on the recently launched Blackberry 9720, just check out Unlocked Mobiles and place your order. Update: It appears as if the device is also available on Exapnsys for pre-orders for £179.99 but they haven’t mentioned any exact availability date.